Please mark your calendars for September 14th Meet the Teacher/Parent Information Night. The evening begins at 6:30 in the parish hall. The school will be relaying some very important information in regards to the upcoming school year and parent participation. After the short gathering, parents will then proceed to their child’s class to meet the teacher. Teachers will share information for the year ahead. It is really important that you attend this evening and 1hour of parent participation will be given to every family who attends. This is one of two mandatory nights for families so please make arrangements to attend (the other night is the AGM/Parent Support Night in January). Children do not need to attend. PS: If you have any used uniform(s) to donate, this is a great opportunity to do so. At our Meet the Teacher/Parent Information Night on September 14th at 6:30pm, Michel DesLauriers will be inviting everyone to attend an information session on September 20th here at St. Bernadette’s. Please see below to gain more information. If you are bringing anything to the school for your child (lunch, homework, etc. ), please leave the item in the green bin outside the classroom. Please do not disturb the class for any reason. If you are picking your child up during school hours for an appointment, etc., please sign him or her out and have Mrs. Gelz or Mrs. Spanjers get your child from their class. Our Calendar is now updated for the 2017-2018 school year. The school exclusively uses google calendar and events are added and changed throughout the year. Please check the calendar regularly. It is best practice to add the calendar to your own google calendar so that you can see the updates as they happen (there is a + symbol at the bottom of the calendar for you to click to add). You can find our calendar under our “School Life” tab on our website. We already have a healthy amount of registrants for our club and we are expecting more in the next few weeks. The hours are from 7am – 8:30am and 3pm – 6pm school days (Wednesdays are 2:15pm – 6pm). For the half days during the school year, we offer the Stingers Club after school on those days. The stingers club is open to all students. It offers fun activities and learning opportunities beyond the classroom. If you would like more information, please contact the office or download a form from our website. St. Bernadette’s is a nut aware school. 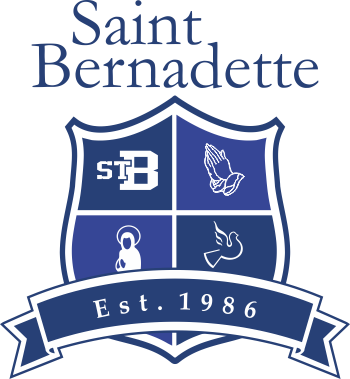 St. Bernadette’s is committed to not allowing any nuts and nut products on the school premises. We ask everyone to remember that no nuts of any kind are permitted in the school, due to severe food allergies. Individual classes may have other dietary restrictions based on the students in that class. If this is the case for your classroom, you will be notified. St. Bernadette’s promotes a waste free lunch. Students will pack in and pack out their lunches. This helps with the composting measures and allow parents to monitor their child’s nutrition at school. Last year we had new lines painted in the parking lot to increase child safety. The design is also provides students with more activities during recess and to provide better safety measures during school hours. The solid yellow line running parallel to the school field and playground is not to be crossed by any vehicle from 7am (the start of Stingers Club) to 6pm (the end of Stingers Club). This is to ensure proper safety for our students. Parents that are going to be driving for Field Trips, Sports Events, etc. must have the Volunteer Driver Authorization Form completed and returned to the school ASAP. If you did not receive a form and your are requiring one please contact the office. A few brief notes with updates to our hours of operations, contact information and return exchange process. Our hours are adjusting for September and we are closed on Labour Day. • As of September 1st our hours of operation are Monday to Saturday from 9:00am – 5:30pm. • We are closed on Sunday’s and Statutory Holidays, including being closed on Labour Day. CONTACTING CAMBRIDGE – please note that our telephone system has changed to better assist our clients. As there is a high volume of calls and orders being placed during the next 2 week period, we ask for your patience and understanding. Please allow up to 24 hours to receive a reply on your request. • Email orders@cambridgeuniforms.com for order related inquiries. • Email info@cambridgeuniforms.com for online school code or general inquiries. • The customer service telephone number is 604-924-9069 or toll free 1-800-924-9069. All voice messages are recorded and emailed to our orders desk. Please ensure your voicemail includes your child’s first and last name, school he or she attends, the best number to be called back at and the details for how we can assist you. We will contact you back with 24 hours. • If your school allows returns to be left with the reception, the next scheduled pick up for returns is on September 8th at your school. This does not apply to all schools. • Families requiring a return or exchange prior to this date must ship their return to Cambridge Uniforms directly (we suggest using Canada Post), this will expedite the process of individual orders. • If there is a need for a rush return or exchange our suggestion is that a new order be placed. The returned goods can be sent back with the school pick up on September 9th and Cambridge Uniforms will issue a refund once received. • Our Return/Exchange form can be found on our website at: http://www.cambridgeuniforms.com/returns. All returns must be accompanied by this form.